- This quote from the scorched page below was allegedly written by either Allen W. Dulles, Director of Central Intelligence (MJ-1) for the CIA from 1953 to 1961; or by CIA Director John McCone from 1961 to 1965 and was CIA Director when President John F. Kennedy was assassinated on November 22, 1963. 1st page of a 9-page memo allegedly written in 1961-1963 time period. Leaker said he worked 1960 -1974 in CIA counterintelligence for James Jesus Angleton, Director, CIA Counterintelligence from 1954 -1974. 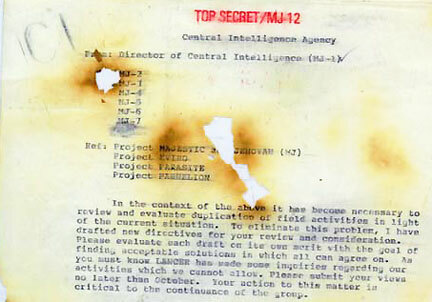 After Angleton died in 1987, leaker said he pulled nine pages from a fire of Angleton's most sensitive MJ-12 secret files. All burned images provided by Robert Wood, Ph.D, Majestic Documents.com and retired from McDonnell Douglas Corp. See 5-part 2011 Earthfiles report with all memo pages at the end of this November 22, 2014, report. The 16-foot-diameter granite CIA seal in the lobby of the original headquarters building. 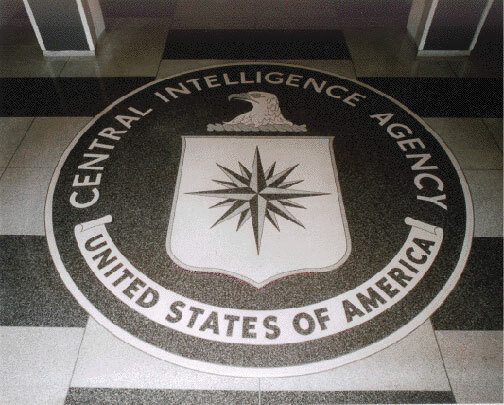 The official seal of the Central Intelligence Agency approved on February 17, 1950, in President Harry Truman's Executive Order 10111. The CIA came into being on September 18, 1947, when Truman signed the National Security Act two and a half months after the recovery of at least three wedge-shaped craft and non-human bodies from three different sites in the region of Roswell, New Mexico. The majority of the provisions of the Act took effect on September 18, 1947, the day after the Senate confirmed James Forrestal as the first Secretary of Defense. A year and a half later on May 22, 1949, Forrestal was found dead at Bethesda Naval Medical Center where he had been treated for severe mental depression. Were the stresses of trying to cope with an extraterrestrial presence while carrying out strict policies of denial about the ETs the true cause of Forrestal's mental deterioration and suicide or murder? Next PostNext Are Cows Being Implanted Like Human Abductees? Or Are Excision Technologies Self-Activating, Miniature Heat Devices?